The San Diego City Council on Monday chose District 9 Councilwoman Georgette Gomez to be new council president. 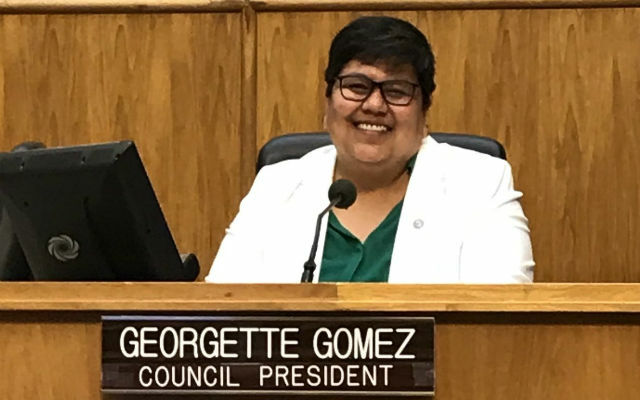 Gomez was selected on a 9-0 vote to succeed former Councilwoman Myrtle Cole, who lost her re-election bid in the Nov. 6 election. Gomez takes over at a time when the council continues to move further left. Democrats on the technically nonpartisan council now hold a supermajority and Gomez, one of the council’s more progressive members, will now wield significant power over the issues the council rules on going forward. District 1 City Councilwoman and President Pro Tem Barbara Bry, who has also been floated as a possible mayoral candidate in 2020, nominated Gomez for the council presidency. In voicing their support, council members Scott Sherman and Chris Cate, both Republicans, praised Gomez for her transparency in spite of their disagreements on myriad issues. Gomez takes the council president seat on the eve of her third year representing District 9. Gomez won her seat in 2016 after Marti Emerald decided against seeking re-election. Gomez is the chair of the City Council’s Smart Growth and Land Use committee and chairs the Metropolitan Transit System Board of Directors. As council president, Gomez is also automatically granted a seat on the board of directors of the San Diego Association of Governments.